2016 Winner of NBC’s The Voice: SUNDANCE HEAD, bringing his unique Soul Country sound; Texas Country rising star and currently exploding into the mainstream music scene: KIMBERLY DUNN; Billboard Magazine’s top-10 blues guitarist MARK MAY and his band; acclaimed Stevie-Ray Vaughan tribute band, TEXAS FLOOD; and singer/songwriter WILL CARTER, all gathered on one stage in our historic Tomball Depot for an event you’ll never forget. 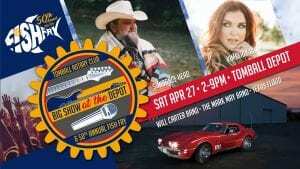 We are proud to present to you our 50th Annual Tomball Rotary Fish Fry and Inaugural Big Show at the Depot, hosted by KHOU-11’s CRISTINA KOOKER, on Saturday, Apr 27th from 2pm until the music stops around 9pm (gates open at 1pm). All proceeds support the Tomball Rotary Club & Tomball Rotary Foundation and our efforts to grow scholarship and community service in the Tomball and northwest Houston metro area. Many food options will be available for purchase all day from local food trucks and of course our acclaimed fish dinner is served beginning at 4pm. Fish dinner tickets are available from the Ticket Booth for $10 or TWO (2) FREE are included with each GOLD TICKET purchase. Browse the Event archive. Category: Tomball - Magnolia. Tags: Community, Family Events, Food, Fun, Fundraisers, Music/Concert. Bookmark the permalink. Both comments and trackbacks are currently closed.